Excellence is subjective and the benchmark excellence is reset every now and then. the real estate landscape in kerala will soon witness such a profound change in the definition of excellence. 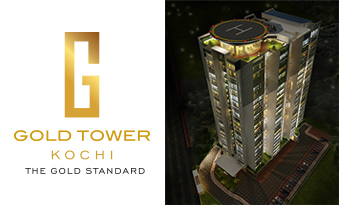 Joyalukkas Lifestyle Developers(builders and developers Cochin) proudly presents Gold tower a soaring 22-storey skyscraper, with 24-carat luxury embedded init. Everything about Gold Tower is truly world-class.The elevation the amenities, the plans , the fixtures & fittings... everything at Gold Tower carries the stamp of universal excellence. Plunge in to the sparkling blue water of the pool swim away your woes,frolic in the company of your littile ones. Enjoy every bit of the water world with gay abandon| Besides the sparkling pool ,Gold Tower offers a splendid of lifestyle facilities. Elegance is a state of being. It's subtle, invisible and discreet.It's a soft whisper of evolved tatse. It defines class and charachter.Gold Tower Offers a medley of superlative features to create an unequalled ambience of class and elegance. Joyalukkas lifestyle developers a cochin based Buidlers and developers presents soaring 22-storey skyscraper tower called Gold Tower with 24-carrat luxury embedded in it.The builders and developers of gold tower called the Joyalukas lifestyle developers carries the stamp of universal excellence. As of its excellence we are the best builders and developers of cochin ( kochi ) kerala. Our first skyscraper gold tower is 22 storeys + amenities floor+ helipad designed by a team of internationally reputed architects.with 3.3m floor to floor height, Centralized air conditioning, Toughened double-glazed windows, European-made kitchen cabinet with built-in hood, Centralized gas system and much more..